Greetings from YFL!!! This is the 5th week of the month, thus that equates to Bonus Week!!! Deb’s physical practices will center around Sukha (Yin)-Stirha (Yang) Plus (+)=Yoga Nidra. 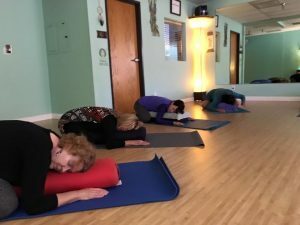 The practice sequence will equalize the energy forces of yin and yang, and will conclude with Deb leading you into a deep subconscious level of the mind, or into the yogis’ sleepless sleep state via a script for Yoga Nidra. 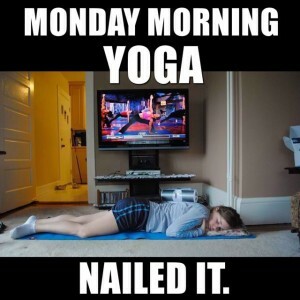 This will prepare you for a deeply relaxed state into savasana. Deb will provide more details in class, and this topic will be featured in her September YFL newsletter!!! The Sanskrit focus is “Metta”, or “lovingkindness”, for self and all sentient beings. The supporting mudra (hand gesture) is the “Earth Hand Pose”, or Prithivi, and it promotes sharpened sense of smell, liver cleansing, strong hair, nails, and bones. It helps with spirituality and mood changes. Our meditation focus is also “Metta”, or “lovingkindness”. The music I have provided on the blog for meditation this week is the classic, Claire de Lune. Special events for September include the following: YFL will be OPEN on 9/1, but CLOSED Monday, 9/3, in observance of Labor Day.The September YFL Newsletter will be on your email desk at 10 a.m. on 9/1!!! Reiki I training is on 9/16, from 10 a.m.-3 p.m. @ $150, led by Kim. Deb will lead the Fall Equinox Drum Circle on 9/23, from 5 p.m.-6 p.m., and it is FREE. Sophie’s “Yoga for Grief” workshop will be on 9/29, from 1-3 p.m. @ $25. Deb is still working on our YFL Fall Retreat, and our second seasonal Tibetan Bowl Healing Concert will be sometime in December. This entry was posted in Uncategorized on August 26, 2018 by Deb Potts. To the Wall and Back!!! Greetings from YFL, and Happy Monday!!! This week we travel to the “Wall & Back” on our mats!!! That magical week of using the wall as our prop of resistance!!! Why you ask? The wall provides focus, alignment, and power to our asana practice!!! The weekly Sanskrit focus is “Sarvesham Shantir Bhavatu”, or “I wish peace for ALL BEINGS”!!! Our supporting mudra (hand gesture) is the grounding form. Our meditation focus is “Patience”, and you may listen to the music provided on this blog, while meditating each day. The music selection is James Hood’s “Eternity”. Summer is winding down, and we will celebrate with a special event, The Sound Bath Concert, on 8/25, from 1-3 p.m. Registration is now CLOSED!!! If you registered, please make your payment by the end of this week, $25. Beginning this Fall, Deb will be offering a monthly, FREE meditation class!!! It will be on the third Thursday of each month from 7:30-8:00 p.m. Each month will focus on a particular method and theme for achieving the “meditative state”. This class is OPEN to anyone that wants to meditate in the energy of a group setting. The first session will be on 9/20!!! The FALL EQUINOX Drum Circle will happen on Sunday, 9/23, from 5-6 p.m., and it too, is FREE!!! 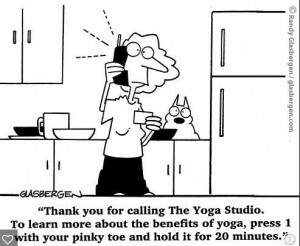 How to have a yoga body…have a body and go to yoga!!! :-)!!! This entry was posted in Uncategorized on August 13, 2018 by Deb Potts. Happy Monday!!! Aaahhh…it is time to restore, renew, and refresh this week!!! Prepare to relax, and stretch deeply with the use of time and props in your asana practice!!! Our Sanskrit focus is “Brahm Ananda”, or to rest in and share the energy of “happiness”. The supporting mudra (hand gesture) is “Dhanya”, or the hand position for evoking meditation and contemplation. Our meditation focus will be “Siddhi”, or connecting to our “authentic self”, and detaching from ego. This establishes our deeper connection to “Source” leading to bliss. These three components: restoration, Dhanya, and Brahm Ananda, practiced together create our “Sankalpa” for the week, our intention for practice. Of course these are suggestions, and you should always create and tap into your specific goals, and resolves each time you step onto your mat. This is the last week to sign-up for the Sound Bath concert, which will be happening on 8/25, from 1-3 p.m. The cost is $25. Kim’s Reiki I training is also fast approaching. It will be at YFL on 9/16, from 10 a.m.-3 p.m., and the cost is $150. The details are posted on the YFL Facebook page. This entry was posted in Uncategorized on August 6, 2018 by Deb Potts.